My final thoughts on China are that I appreciate everything I have here in America. I couldn't imagine living in China for any amount of time where there is no freedom of speech, women are a lower class, and organization and common courtesy are thrown into the wind. The people I met and the experiences I had while there were life changing, but I really didn't know it until my last day. I missed home desperately even though I can usually never think of anything but how much I want to leave. I felt almost pro-America for a bit even though I disagree with many decisions from the way of life and government. But I appreciate everything I am allowed to hate and love about where I live and what I do. I appreciate that it's my decision to fail if I want to. I also missed the culture I didn't know I was so keenly apart of without completely realizing it. The way people live their lives in other countries have always fascinated me, but I love the way I live here. I wrote a list of things I will miss and not miss about China below. All I am saying is, I could never be away from the amazing food quality and variety I have here, the quality of air, the quality of life and the freedoms that are usually numb to my brain but I feel strongly for anyway. A place that is ridden with traditions, yet is throwing themselves into the largest economy is pretty amazingly unorganized and behind the times. China feels like the 1900's with too many people, technologies and money to know what to do with itself. The great facade that is China will soon go through a cultural revolution once again, but this time I hope for the better. I do not believe the people will stand for what they are given once the truths and better lives are known, and once they have the power to make world decisions. The toilets, lack of toilet paper and soap. The Great Wall of China is one of the seven wonders of the world, it is over 4,000 miles of an ancient barrier to keep out Mongolian warriors from invading China. The wall was built for many years and many people died making the wall and are buried inside. All of these facts made me want to see the genuine wall instead of the restored "Disneyland of the Great Wall" Badaling. I chose to travel 70 miles out of Beijing for a day trip to Jinshanling. This is a portion of the wall that has some unrestored "wild wall" from 700 years ago, as well as some restored portions from the late 1980's. I heard great reviews of the walk from Simatai to Jinshanling, but Simatai is now being restored. Many parts of the wall are falling apart and will most likely never be seen in the original state by many people. We started out at 9am outside of downtown Beijing and traveled 150km to our site. Lucas' two sisters joined us for their first time seeing the unrestored wall (that they can remember). It was pouring rain that day and Chinese traffic was as fun as ever, but we made it to Jinshanling around noon nonetheless. The way out through the mountain villages was beautiful. We took a sort of long way, but we were able to see the mountains and trees sprawling on both sides of the street for miles. The leaves were changing colors so the bright reds, yellows and greens were bursting out everywhere. There were only about 10 cars in the parking lot when we arrived and basically nobody outside at all except for the vendors to sell souvenirs. We paid our 150 quai for four and we started our jouney up to the first tower in our sight. We were followed by old people who lived in the village and wanted to sell us bags, but after that small stretch of human activity we were completely isolated. The wall was spectacular and zig-zagged through the land as far as we could see. We first walked through the restored part of the wall that seemed old and crumbled to us at first, but was easy to maneuver. Up and down steep stairs, and through dark halls in the towers, we reached the places where the battling would occur, where the Chinese warriors would set up obstacles for their opponents and where they could shoot arrows from about anywhere on the wall through small holes at arm level. We met a man that claimed to be the best Great Wall photographer, and he was. We bought his book and had him sign it for us. The pictures were stunning and I knew why everyone goes to Jinshanling to photograph now. We took some photos of our own and hiked for an hour or two before we reached the wild wall. The unrestored wall from the 1300's was now before us and it was completely obvious at our first glance. There was a two story tower that had completely collapsed and was in ruins. Parts of the wall had been completely crushed and had fallen down the mountain to reveal a large cliff that we could easily fall down. This part of the wall was more of a reddish/brown color and reminded me of the rocks and mountains that held up the entire wall. You could see the craftsmanship of 700 years ago and imagine what material they had and what they would have seen so long ago (minus the highway in the back). Some people were walking through the forest and had a donkey with them. It seemed like we were back in the old days when the wall was being built. Our only way down was a muddy path that took 30 minutes to hike down. There was donkey manuer and no sign of where we were going except for the dirt path that we had to trust. Small farms of corn and lettuce lay down in the valley with small cottages for the villagers. It didn't seem like we were in the 21st century by far now. We reached the small parking lot and headed out of Jinshanling. The sun came out for the first time in 2 weeks for me, and the sky had beautiful clouds surrounding the fall leaves on the forest of trees around us. It's been a while since I've blogged about our trip, so I'll sum it up in one post for four days. Friday we slept in and then went to the expo at night. It was a lot busier than we expected and we couldn't see the pavilions we were looking forward to because of the 3 hour lines. We ended up seeing the Shanghai Corporate Pavilion which did not have the robot restaurant as they posted on the website, it was pretty lame and just talked about butterflies and dreams. Saturday, we went shopping and then to our new favorite vegan restaurant Vegetarian Lifestyle/Ju Ju Be! It was gourmet vegan food Chinese style and it was so good that we wanted to bring the chef home with us. I will post a review after this. Next, we went to a party at The Apartment which is a club in Shanghai. It was majorly crowded and the whole place was a giant smoke ball and there were way too many obnoxious foreigners there. We did meet some interesting friends of Ali's though. They were mostly all different foreigner travelers who lived and worked in Shanghai now. They all have a different story of how they arrived in China and why they stayed. I would definitely not be able to stay here longer than the two weeks, but they were chasing careers, a different life or girlfriends to come here and decided to make it long term. We celebrated Lucas' birthday with our 10 vegan cakes from New Age Veggie. They were pretty amazing and a big hit at the party. People we didn't even know were grabbing spoons and jumping in on the black forest cake or chocolate mousse. We left there around 12 and got to bed for another day at the expo..
Sunday I cooked vegan stir fry for a bbq at Ali and Lucas' friend Deter. We had tons of food that was not Chinese but had lots of veggies. We had hummus and bread, fruit, Chinese coke and beer and coffee. We headed next door to Deter's house for a relaxing sit in the backyard and then headed to the expo. 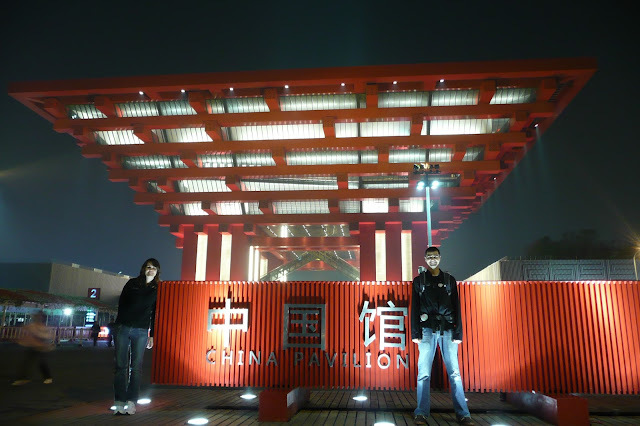 This day, we saw the Broad pavilion which is the most sustainable building in the world. It was built in one day and is extremely efficient. The building had a room with the cleanest air in the world, but of course no one was allowed in because we all would ruin that title. We looked at simple devices that created a better household including triple paned glass, air purifiers, and styrofoam insulation. Monday, we got to the train station to buy our tickets and after a confusing time finding the ticket machine, everything was sold out. Lucas went looking for other options like China Easter Air, but only scalpers were offering train tickets and harassing us for most likely fake tickets. We went to the ticket counter for a billion people in line and finally got to the window to find that the self-ticketing was wrong and they had a train the next night - but they didn't take credit card as the information center advised earlier. We immediately jumped out of line to get some cash before the train ticket was gone again! We ran around the city trying to find the Plus symbol for our card. After many attempts and running into crazy traffic we found a bank and got back to the front and finally retrieved our night train pass (about $26 each for a hard chair). The only bad thing is it will be 13 hours on a hard seat, with smoking rural people that smell a little funky. We headed off to the expo for a couple hours, and since this was Lucas' birthday we got to see some more green buildings and the pavilion of future. After some amazing animated videos of future life living in space or under water with awesome electronic dance music and ideologies, we headed to Ju Ju Be again for a birthday dinner. We met up with Ali, Kelly and Pierre for a huge dinner of fake crab cakes, spare ribs, eggplant stacks, cucumber tuna appetizers and more. We ended the night with an expensive bottle of Champagne and three Frenchies in one restaurant together. Now, it is Tuesday, our official last day and we will see the Yu Gardens, the Bund and finish the expo. See you in Beijing! Thursday morning, October 14th...we woke up at 3am and decided to try our luck with the Chinese Pavilion. We heard from the guys we met at the cafe that a reservation was needed, but was worth the wait (which is not always the case!) so we researched it a bit and found that we needed to be in line at 6am for the 9am entry to try our luck at getting a reservation. We got ready and headed to the madhouse. People were running all over the place to get in line for the next line into the expo. It started to rain and we were fine because we were saradined into the line with hundreds of people with umbrellas. The vendors pestered us for baby chairs to sit on and ponchos and we watched people eat bao tsu and soy milk, as we stood hungry and impatient. We met a woman who was a Chinese woman who lived in Switzerland in line, there is always someone who speaks English somewhere, right when I'm talking about the stinky guy in front of me thinking no one understands me! But she was nice and was surprised with my height, she asked in every American was that tall. I noticed I had to represent all Americans in China basically. I also noticed that the expo/Chinese government had to be lying about the 5% foreigner rate at the Expo. It was about 99.9% Chinese to .1% foreigners. We waited 3 hours and finally got the reservation! It said we had to go to the Chinese pavilion at 8:30pm and we got up a 3am...hmmm, tiring day ahead. Since we could not get into China, we headed to the theme pavilion next to it called Life Sunshine Pavilion (great names here). We figured out that these theme pavilions were usually a lot better than the country pavilions and were less about propaganda and more about great technologies and felt more like a museum. One of our favorite places in the Life Sunshine pavilion was a story of six families all over the world and their different lives in the city. One from Shanghai, Netherlands, Australia, America, Africa and South America. Their different cultures and ways of living were videoed and statistics of life in those cities were shown. Numbers on fresh water, working hours and if they lock their door plus a ton more were shown. Very interesting for us indeed. They had wax figures of all the families and in front of the white family from Arizona a Chinese woman grabbed me and took a picture..I was now apart of this exhibit. Of course people stared, but now people were looking at me like I was apart of the American family and they learned more about me as I learned about the Shanghai family. Another woman asked for a picture with me and spoke in Chinese about my height (Lucas told me later) and gave me her 2 year old to hold. 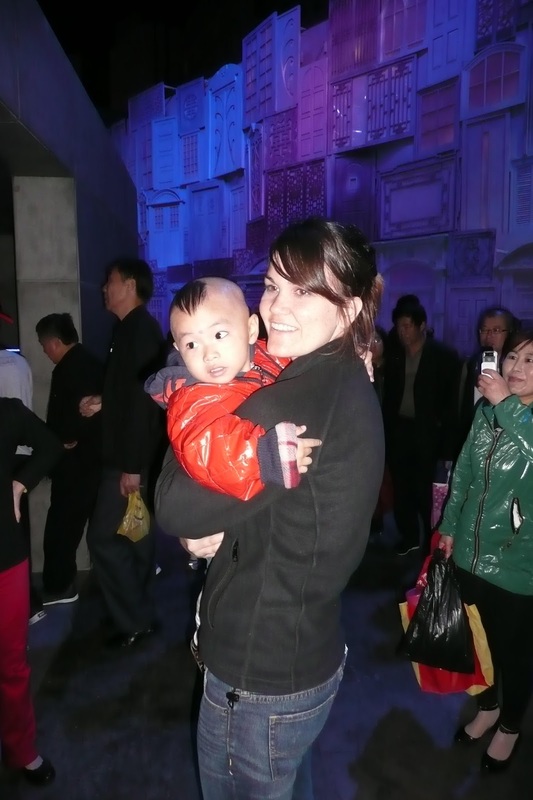 A bunch of people took pictures as I held this little boy with a bald head and bangs. Weird and hilarious feeling. After, we went straight to Zone C, the European zone to try our luck at cutting lines. With a passport from the country you can go in VIP, so we got to get into France with Lucas. France was extremely disappointing, maybe one of the worst big pavilions. It was a bunch of projected images of France like I was watching a tv show about historical sites in Paris. The theme was about the senses (even though it was supposed to be a green theme like the rest of the expo). You got to smell coffee and pastries in one part, touch tiles from France in another (lame), see pictures of the Eiffel Tower (super lame), go past a random Louis Vitton ad campaign and you could play these video games where you popped bubbles, which was fun but gave France a grade of FAIL. They also had a cafe that served meaty meat dishes and wine. A glass of wine was over $100!, which would be probably a month on a Chinese salary. We met a guy on our first night that was a German working at the German pavilion. He let us go VIP into Germany and that was very much appreciated because the line was horrendous here too. Germany was one of our favorite pavilions because it stuck to the green theme and was interactive. They showcased world changing green technologies from Germany while also having fun and letting people look like a gnome, play with snow-globes and play a puzzle game with augmented reality. The main attractions was this massive hanging ball in a three story room. It used the energy of people's voices to swing around in circles and side to side, definitely pre-programmed but the idea and show were amazing. Since we were master line avoiders we tried our luck at the foreigner card. I headed to the Norway pavilion and told them I was Norweign (one quarter Norweign counts!) and they let me in without a passport! Not too interesting of a pavilion, but we skipped another wait..
We tried that at Ireland (about 1/4 Irish works too!) but the evil Chinese man in the green jacket pretended to look Irish wanted my Irish passport. This didn't work at Canada either! I was trying the white girl card - that I could look like most of these countries, but it wasn't working anymore! Sri Lanka worked for Lucas so we got a couple, so far so good. By now it was about 6pm and we were pooped. Being shoved around by the Chinese, smelling dirty trash and hearing the spitting sound throughout the whole speech from Obama in the US pavilion was a bit tiring for me. We met another local Chinese and found out more about the Chinese pavilion. We did not have to wait for our time at 8pm and the line is usually 2 hours with the reservation! We ran down there for our first peak at our favorite pavilion. The outside is so beautiful and enormous. The bright red exterior and inverted shape fascinates me still and we continued to photograph it from every angle. The Chinese pavilion was pretty amazing, the biggest attraction was this massive scroll of ancient Kaifeng showing the Qing Ming Festival (the Chinese Mona Lisa) but it was animated on a large screen hundreds of feet long, twisting through this room. It was really amazing and seemed real. There was also a weird ride that was completely over my head because they didn't translate it. It seemed like a winter-wonderland in the clouds and I cannot understand what the hell that had to do with anything about China or the green theme, but it was entertaining and scary - rolling backwards towards the other cars is not fun. We headed down stairs viewing painting from young Chinese children that looked like masterpieces and the last part was a waterfall that spelled out Chinese characters. The scroll was the main attraction and very cool to look at and I'm glad I got to see this exhibit from the inside. Tired and feeling dead, we headed home by taxi and knocked out like every other night! Since my last post we have been super busy. We have walked 20 miles a day and have seen a lot more of the expo and the local people. We met up with a girl I met online through the Shanghai Veggie Club who is opening her own vegetarian cafe in downtown Shanghai. It was amazing to see the hardships of life in Shanghai, being vegan in China, food and healthy options, and being a women entrepreneur here too. We met up at Annamaya, a vegan restaurant walking distance from Ali's place on Fuxing Lu (review below). We met another women entrepreneur, Kazu, and we learned a ton about what is not available here when it concerns items I cook with everyday. Vegan and healthy foods need to purchased on Chinese ebay or in Kazu's case when she travels back to Japan! This is something China needs to think about desperately. We found that it is also really hard to find brown rice when they harvest it in China too. They export a lot of their products to western countries like the US and they forget about their own people and only allow them to purchase brown rice if it is re-imported! The next day, we went shopping and cooking with our new friend. We went to the City Shop and got to see the only store that imports products from around the world so the Chinese have a chance at some higher quality or vegetarian/organic options. The prices were about 5x what they are in the states and they still did not have things I purchase at Mother's market or Whole Foods by far. It was mostly looking like foods you would find in a Cost Plus World Market food section but overpriced. After City Shop we headed to the open market which was across the street from the future cafe. There was piles of homemade tofu and seitan which was nice and there were tons of vegetables that looked like we were in a farmer's market. We decided to make Babycakes' vegan pumpkin muffins together because most of the items were attainable, and I had brought agave with me. We cooked in the cafe that is soon to be opened. The Chinese don't usually have full sized ovens in their homes so we worked with two different toaster ovens, but it worked well and they came out tasty, and made me feel at home again. Two friends of the girl came by and we got to talk to more locals about the expo and life in Shanghai. Their English was also excellent and everyone we have met is like them and super nice and better at English than I would think. That night we planned on heading to the expo, but we were exhausted again and passed out at 5pm! The trip is coming closers now, only 1 month and 10 days! Our planning continues and I think the final plan is official on Trip It. We will spend more time in Shanghai (October 10th to October 18th) to get the full World Fair experience as well as the Shanghai culture, food, sights etc.. We will head to Beijing on October 18th on a night train and arrive at 11am - just enough time to catch a few hours of the countryside, something I wanted to see on the way there instead of passing by on a plane. There is more to learn, especially Mandarin, and I'm still thinking about picking a Chinese name (the travel show we watched today had a guy named Plum Blossom), so if there are any recommendations, I would appreciate it!